Mission Harvest America, Inc. is a Public Trust Level 501c3 nonprofit international humanitarian and educational aid organization that is faith based. We have provided services starting in Northeast Florida, extending to over 43 states and 70 countries. 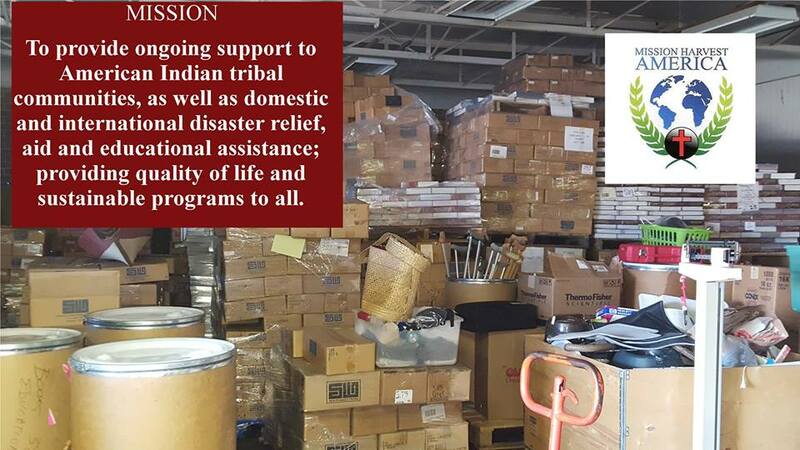 Over 8300 shipment of materials carrying in excess of 217 million pounds of relief and aid to areas of need have been made. With our SEAIC partner and network, we do needs assessment, followed by education and navigating for tribal groups in the South East. We network with the University of Florida, MAYO Spirit of Eagles, and Departments of Health for Florida, Georgia and South Carolina to identify needs in the tribal communities, recruit and train Community Health Workers [CHW] and navigation those in need to find affordable medical provider care. MHA has provided aid to over 70 countries in the past 27 years, meeting humanitarian aid and relief needs and establishing education and orphanage programs. We have several orphanages in Haiti and Liberia currently being supported and development of a University level education system in both of those countries. We put in 4 wells for villages needed fresh water. We own 100 acres of land in Liberia where we are building a Children’s village for the orphans and a village for the deaf, plus the campus for the university. In Haiti we own 70 squares of land and we are working with several opportunities to receive a donated fully operational small hospital, and a high school that was shut down after the earthquake. Four container shipments have been made to Liberia this year with over 143,000 pounds of materials. 65,000 pounds were text and library books to open a public library which is a rarity in there. MHA has responded to almost all disasters in the US and abroad over the past 27 years. In Katrina we sent 169 semi-trailer loads of relief materials. For Haiti after the earthquake we sent over 200 40-Foot Containers of materials and used some of the containers to build a school and orphanage. We shipped 4 containers to Japan in response to their earthquake, several shipments to India for the Tsunami wave that caused so much loss of life creating a great need for water, we sent 1500 stand-alone water purification system... We are currently staging to respond to Hurricane Florence after it passes the US East Coast. As an organization MHA does not consume the products donated, we are able to take the excessive of businesses or individuals and distribute them with accountability to meet ongoing disaster needs or continued humanitarian need. In addition to material donations we need financial donations and grants. 95% of every donated dollar goes to support the efforts of MHA to help others. We have no employees and we are an all-volunteer organization. How did you hear about Giving House? If someone else told you about Giving House, who are they? This is so that we can make a $500 donation in their honor to a charity of their choice when you close on a property. I'm buying a house soon. I'm selling a house soon. If you're interested in buying or selling a house, when do you plan to do so? If they register to become a Giver and buy or sell a home with us, we'll donate 25% to a charity of their choice AND donate $500 to a charity of YOUR choice.